One of my favorite things about travelling abroad is exchanging currency. I always tend to bring a little bit of foreign money home with me as a keepsake when I travel abroad. And, friends back home always seem interested in taking a look. I think the bring-it-home approach might be a bit overboard for this trip. 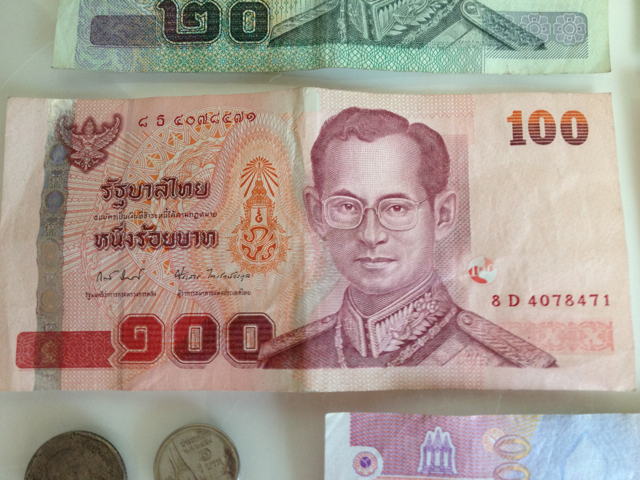 So, I thought I’d create a series of posts to keep tabs on “what I’m spending.” First up on The Money Trail, the Thai Baht. Baht, like many foreign currencies, come in different colors and sizes depending on denomination (hear that US Mint?). Bills are very colorful, and depict Bhumibol Adulyadej, Thailand’s current and longest reigning Monarch. Having reigned for 66 years, Adulyadej, or Rama IX, is also the world’s longest serving current head of state. This entry was posted in Adventure 2012, Culture. Bookmark the permalink. I love keeping money as a souvenir. it will be fun to see the currency from the places you are traveling!